A stop sign is posted. Under no circumstances should a motorist drive through, around or under any crossing gate while the gate is lowered. 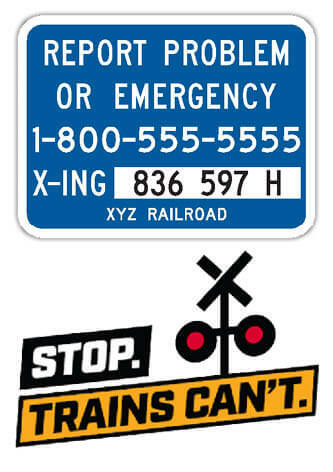 After stopping, remain stopped until all tracks are clear, all railroad crossing warning signals stop flashing, the crossing gates are raised, and it is safe to proceed. Look both ways and listen carefully. If it won’t fit, don’t commit. Do not enter a crossing unless you can drive completely through without stopping! Keep going once you start. Locate Emergency Notification Systems (ENS) sign containing emergency contact information. Call for help! Tell them a vehicle is on the tracks.